Texture2D instances can be created through Glue by adding image files to entities, screens, or global content. By default, any image file added to Glue will be loaded when the containing screen/entity is created. Files added to Global Content can be accessed as soon as the game launches from any screen or entity. 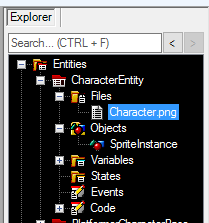 Create an entity with a Sprite object. See the Sprites in Glue page for more information. 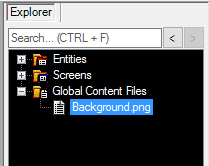 Drag+drop a .png file from any location on your computer onto the entity’s Files object. Note that if the file is not located in a subfolder of the game’s Content folder, the file will be copied. The sprite will now use the selected texture. 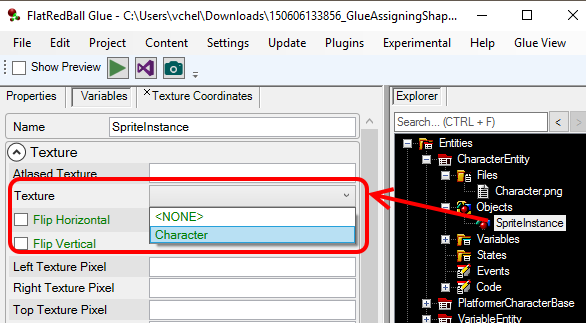 Texture2D instances added to Glue can be accessed in code. If a Texture2D is added to a screen, then the custom code for that screen can access the Texture2D a variable name matching the name of the file (excluding extension). Similarly, if a Texture2D is added to an entity, then the custom code for that entity can access the Texture2D as well. If a Texture2D is added to global content, then any code in the entire game can access the Texture2D at any time. // in a type-safe way.